It's been 5 years since Montgomery County first started talking about a countywide Bus Rapid Transit network, but the County Council could vote on the proposed 81-mile system in two weeks. While the latest round of revisions are good, will councilmembers resist calls from a few residents to cut BRT routes in their neighborhoods? 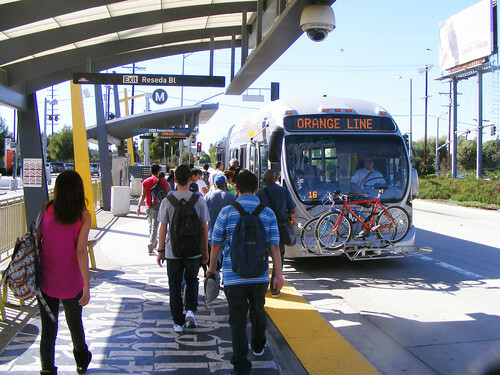 BRT in Los Angeles. Photo by the author. The draft Countywide Transit Corridors Functional Master Plan designates future transit corridors and recommends how to allocate space on our major roads for them. While business, civic, activist, and environmental groups say planning for transit will reduce traffic and support future growth, some residents are fighting to block the plan. Councilmember Roger Berliner, who sits on the council's Transportation and Energy committee, emphasized that it's only the beginning of a longer conversation. "This is a predicate for future action," he said. "Just like when we put the Purple Line in our master plan, we said, 'Hey, this might be a good idea.'" Committee members Berliner and Hans Riemer voted to keep all 10 lines in the system, but made several changes to a draft the Planning Board approved earlier this year. But third committee member Nancy Floreen, who says she's "not an advocate" of the plan, voted to shorten several or remove several lines, as recommended by council staff. The latest recommendations for BRT. Red are corridors with at least one dedicated lane, blue are mixed-traffic, and purple are sections to be determined. The committee voted to remove specific recommendations about how to give buses their own dedicated lanes, whether by widening roads or repurposing existing general traffic lanes. This is probably the most important feature about BRT because it makes the service faster, encouraging more people to use it. But it's also the least popular with neighbors, and some of the proposed configurations had issues. Instead, the plan will say where buses should have their own lanes, but not how to do so. This is probably a good thing, because the county would really have to do more detailed engineering work that's beyond the scope of this plan before understanding the costs and benefits of different lane configurations. As before, about 70% of the network would run buses in some form of dedicated lanes. Councilmembers were split on whether to continue a BRT line along Route 355 between downtown Bethesda and Friendship Heights, which neighbors in Chevy Chase West and Somerset have vehemently fought. 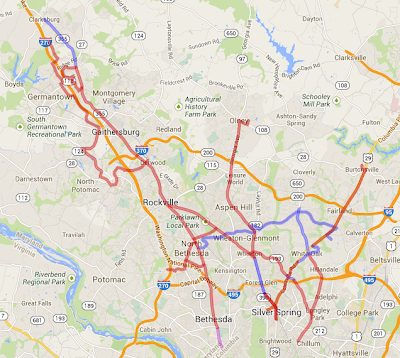 Councilmember Hans Riemer voted to keep it in, while Nancy Floreen voted to end the line farther north, at Grosvenor. Berliner, who represents the area, voted to study it further. Unless the full council decides otherwise, it won't be in the plan. But the committee did vote to put dedicated lanes along portions of University Boulevard in Four Corners and Route 29 south of New Hampshire Avenue, resisting vocal opposition from neighbors. Route 29 is already one of the region's busiest bus corridors, with 40 buses per hour during rush hour, and would serve the proposed White Oak Science Gateway, a research and development center that's already attracting international attention. On Georgia Avenue, the committee backed away from giving buses dedicated lanes between downtown Wheaton and 16th Street, citing "severe congestion consequences" if any of the 6 or 7 lanes were given over to transit. But councilmembers did keep the lanes south of 16th Street, in case DC decides to extend its proposed Georgia Avenue streetcar to Silver Spring. In some areas, committee members recommended alternative or multiple routes for each line. In Germantown, they suggested detouring buses off of Route 355 to serve Montgomery College and the proposed Holy Cross Hospital. And in White Oak, they suggested keeping buses on Route 29 instead of turning onto Lockwood Drive to reach the White Oak Transit Center. Both options are in the plan, but each one is a tradeoff between a more direct route and one that serves the most people or destinations, but takes longer. The committee also strengthened recommendations for Bicycle Pedestrian Priority Areas, which require additional pedestrian and bicycle infrastructure to make it easier for people to reach BRT stations and other destinations without a car. While the original plan simply named 26 areas where this should happen, the committee also called for lower speed limits and prohibiting right turns on red, among other suggestions. If the council votes to approve the plan November 26, detailed work can begin on specific corridors. Maryland is already working on the Corridor Cities Transitway and studying BRT on Veirs Mill Road and Georgia Avenue. Montgomery County also wants to start working on BRT for Route 355, Route 29, and Randolph Road, says transportation director Art Holmes. Many skeptical residents have questioned whether the multi-billion dollar cost of building out a BRT network is worth it and worried about how it might affect their neighborhoods or their individual commutes. The debate has often become bitter and vitriolic, and many opponents weren't always civil. But as our region continues to grow, our neighbors are looking to BRT as a way to give people more transportation options at a lower cost than building rail. Alexandria will open its first BRT line next year. Prince George's and Fairfax counties are also studying BRT, and Howard County Executive Ken Ulman has expressed interest in it as well. A plan like this is uncharted territory for Montgomery County, and the debate we've had over the past 5 years shows it. But we've already made it this far, and hopefully councilmembers will make sure this bus doesn't stop prematurely. Yikes, if the Council is only going to add bus lanes where congestion is minimal, they are really missing the point. If congestion is minimal, people have no incentive to take a bus. I guess we should count ourselves lucky to have dedicated lanes anywhere, but it looks like this plan is at risk of being weakened to the point where it will be a bus but not 'rapid'. Today the council watered the plan down, as it should, by requiring extensive studies and public hearings before any corridor is approved. There is no money for anything. Where is the money going to come from unless from schools? Transit advocates should back lines that make sense, not just to connect the dots because that is your dream plan. The committee staff report clearly makes the case that the South Georgia line does not make sense from ridership or cost. The Council is wise to slow down BRT. It largely duplicates existing transit options -- three existing transit options on Georgia Avenue south of Glenmont and three existing transit options on Colesville Road for example. In addition, it is projected to cost $3000.00 for every man, woman, and child in the County to build BRT and then there would be more costs for ongoing annual operating subsidies. Who is going to pay all that, or do we have to reduce other county services? We shouldn't rush into this without an unbiased examination of the costs and benefits.